Montana is a place that often gets overlooked as a ski vacation destination, yet the northern Rockies boast quality snow on spectacular terrain at uncrowded resorts, both large and small. But with 16 ski areas located in the mountainous western third of the state, how do you choose which ones to visit? How many can be visited in a week? Should you spend all of your time at a big destination resort or road trip a bunch of smaller areas? There are many options and we’ve done some of the legwork for you. There are no direct flights to Montana from the east coast unless you’re leaving from a large metropolitan city (i.e. New York) and if you’re departing from anywhere in upstate New York (Syracuse, Rochester, Buffalo, Albany), you should figure on up to three flight segments. For that reason, it’s a good idea to factor in an extra travel day in case of weather-related delays. Great Falls Airport is the most economical place to fly into and it’s a very pleasant airport, though not in closest proximity to the larger resorts (a three-hour drive to Whitefish or Bozeman, but an hour to the smaller Showdown and Teton Pass). To fly into Bozeman or Kalispell, which are the closest to the larger resorts, you’ll pay at least $200 more per plane ticket. There are shuttles from these airports if you plan to spend your whole trip at one resort and don’t need to rent a car. The beautiful drive to Whitefish from Great Falls along the brown rangelands and then through the Flathead National Forest is only a few miles longer than more direct Route 2, but eliminates driving over Maria’s Pass near Glacier National Park. While Maria’s Pass may be scenic and exciting, if it’s snowing in the mountains, you should check the local road conditions and take a less treacherous route. Whitefish is a clean, relaxed, crowd-free western ski town with the usual ski shops, cafes, restaurants, and just about anything one would need in a downtown. It seems like a very easy-going place to live so it’s no surprise that there are a fair number of transplants from other places, but the excitement really doesn’t begin until you climb the access road and enter another world at higher elevation. Similar to the town it’s named after, Whitefish is a really laid-back area with a mellow vibe. The resort was formerly called Big Mountain; however, this name was often confused with Big Sky. One time, several friends planned a trip to Big Mountain but some of them ended up at Big Sky and couldn’t figure out where the rest of the group was. Apparently, they weren’t the only ones who made this mistake over the years. For that reason, Big Mountain was recently rebranded as Whitefish Mountain Resort. The logo is pretty cool too. The south-facing front side has beautiful views of the Whitefish Lake along with low-angle glades that should be skied before the sun shines. The north side, as one might suspect, holds the best snow. Late in the season, you may find a crusty base on the pitches that get any sun, so pick your aspects carefully. The locals are friendly, but since there are hardly any crowds, it’s not always easy to meet them. You may run into some as they hike with skis lashed to their backpacks or slung over their shoulders. There are numerous hikes to powder stashes in the trees, so the best strategy is to find a mountain host or friendly local to show you the way. If you’re alone, take an advanced powder ski lesson and have your instructor guide you to the best snow while avoiding terrain traps. Venturing out on your own can be dicey, so always ski with a buddy. 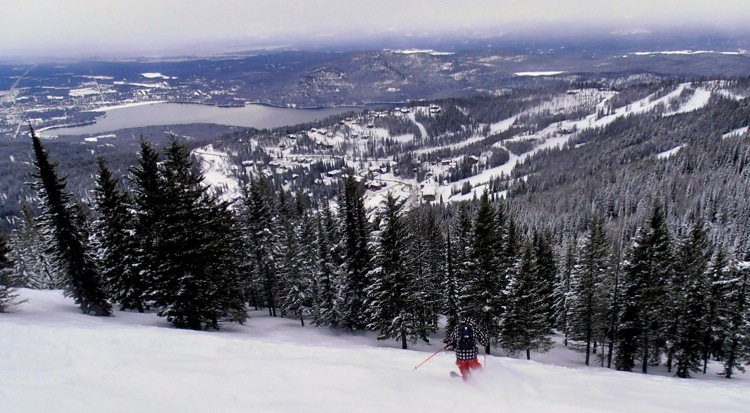 One could spend a full week at Whitefish with no need to ski anywhere else, but there are so many other worthwhile ski areas in Montana. Blacktail Mountain is the closest to Whitefish, with predominantly intermediate terrain. 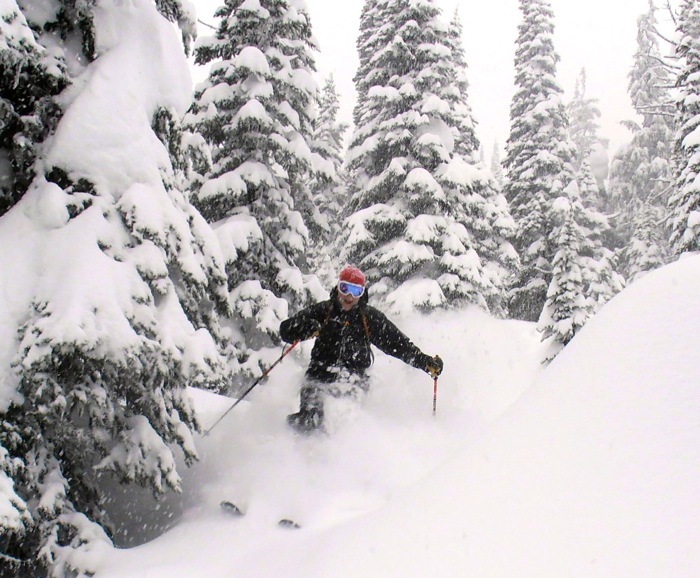 For deep powder on low-angle slopes, try Lost Trail at Powder Mountain, about four hours south of Whitefish. If you’re prepared to cross the border, British Columbia is just under two hours from Whitefish. Discovery Ski Area is quite remote and not located near any major populations, so it’s unlikely that you’ll find a crowd there, and maybe only a handful of people mid-week. The front side features beautifully manicured wide sweeping trails for cruising in the sunshine, while the steep backside is filled with legit double-black-diamond terrain interspersed with widely spaced trees. While the other resorts may get more snow during a storm, the powder that accumulates on the driest north-facing slopes at Discovery sees very little traffic and felt like our own private stash. You could spend all day skiing untracked snow on the backside off the Limelight lift. When the lifts close, you can drive an hour east and soak your bones in the Water of the Gods at Norris Hot Springs, where food and drink are served poolside. They’re open late and have live music in the evenings. Here, you’ll likely find locals, students, and perhaps other skiers relaxing after a day on the slopes. The best ski and stay package for Discovery is at the Trade Winds Motel in Anaconda, a small industrial town just a few miles off the interstate, 30 miles from Butte. For only $92, two people can get a room, two lift tickets, and breakfast. It’s basic and clean and has a hot tub, Wi-Fi and comfortable beds. Spend your savings on a hearty dinner at the Barclay Supper Club just a few blocks away. A world-class resort with a mountain village filled with luxury accommodations and restaurants, and flanked by huge terrain with big vertical, Big Sky is what comes to mind when most people think of skiing in Montana. After arriving at the elegant slopeside Huntley Lodge, handsome cowboys will greet you, unload your car, store your skis in the locker area, and haul the rest of your gear to your room. Throughout your stay, you’ll be spoiled by the friendly, accommodating staff and fantastic restaurants; however, the ultimate luxury is waking up right at the base of the mountain, putting on your ski boots in your room, and picking up your skis as you head out the door to the lifts. With more than 5,500 skiable acres plus backcountry access, Big Sky claims to be the largest resort in the U.S., so you’ll have no trouble finding fresh snow bell to bell on a powder day. The skiing is amazing and one could easily spend a week there. 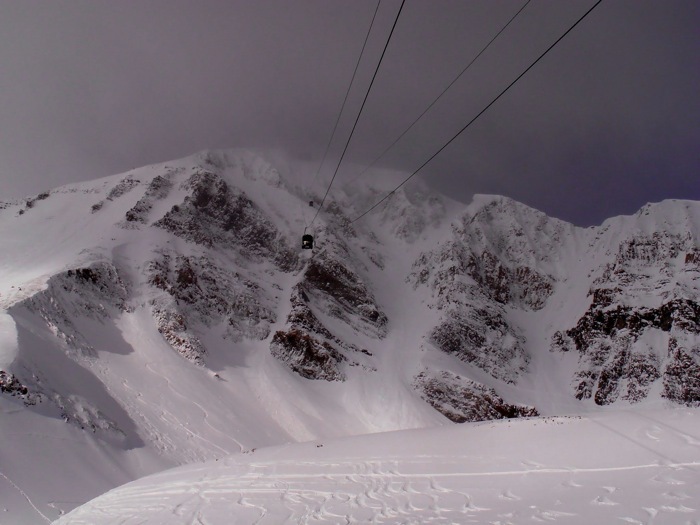 Moreover, the tram that accesses the Lone Peak, the highest skiing at Big Sky, brings the vertical drop to a whopping 4,180 feet. Since you’re at high elevation, the snow stays cold and dry, even after it’s been tracked up. There will be a lot more people at Big Sky than the other resorts, but there’s plenty of terrain for everyone and uncountable hidden stashes. There can be a line-up for the tram that takes you to the renowned terrain at top of Lone Peak, so make sure to get there early, especially if the snow is fresh. To ski the couloirs up there, you have to sign up with ski patrol in advance. In addition, watch out for lurking rocks if the snowpack isn’t fully developed. You need to know where not to ski when the powder is fresh or risk gouging the bases of your skis by sharp hidden rocks. There aren’t many options for on-mountain lunch stops, so if you are a stay-on-the-mountain-all-day kind of person, pack your lunch. There is a taco stand and the cozy Shedhorn Grill yurt, where you can dry off your gear by the wood stove and enjoy bison burgers, brats and soup. There are no bathroom facilities or running water, so you have to ski to the base area for that. If you like to spend the whole day on the mountain, and enjoy skiing in the trees, you can have a picnic lunch in one of the many hidden gondola cars that have been hidden in the woods throughout the mountain. It’s fun to stumble upon these and you may meet some locals taking a break in one of these outposts. One of these even has a grill. Moonlight Basin, which recently merged with Big Sky, is on the other side of Lone Mountain. When I was there last season, you had to buy another lift ticket to ride the chair back up or you could take the shuttle, but there will be skiing at Moonlight and Big Sky on one lift ticket in the near future. The Yellowstone Club is a private ski area whose slopes are visible from Big Sky. You need to be a member or know someone to ski there. 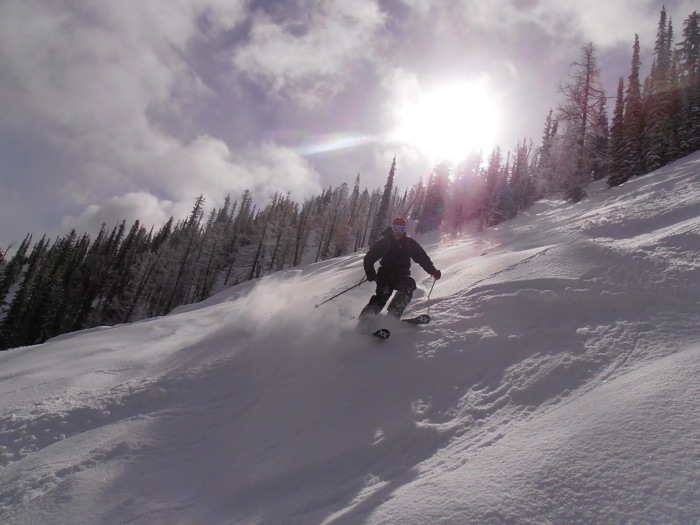 Bridger Bowl, a very short drive north of Bozeman, is more of a local’s mountain. Since there are no slopeside accommodations, it feels more like a family ski area with something for everyone. The in-bounds terrain is interesting but not terribly expansive; thus, if you had just visited Big Sky, the Bridger Bowl runs won’t seem very long. There are some groomed trails and plenty of moguls and trees, but the chutes and steep couloirs are out of bounds in Slushman’s Ravine as well as up on the ridge above the lifts. Getting there requires a beacon, shovel, a desire for adventure, and a good pair of lungs and legs. Bozeman is the nearest city and a great option for less expensive lodging and wider dining choices. It’s a fun college town that offers all the amenities one would want from a larger town. Oh no, I was just getting my skiing jones under control and then I read this! Brings back some great memories. The second photo is a perfect example of why I love Whitefish. Lots of nice stashes if your willing to work a little. Montana is just a great place to ski plain and simple. Nice skiing and nicer people. Great report PDQ and thanks again for setting up a fantastic trip! Won’t be long!!! On the Snow did a neat article about going to Whitefish via rail a couple years back. Never have I traveled that far by Amtrak, has anyone ever tried that vs flying? Don’t forget Turner Mt. outside Libby. Open Fri, Sat, Sun. 2000′ vert. One chair to the top. If there are 20 cars in the lot it’s a holiday. If flying to Kalispell just do one day at Whitefish and then head an hour north across the boarder to Fernie which is much better than Whitefish. There are also some great cat skiing operation just outside Fernie. Hi Guys- I was searching preseason workouts and came across this site. I think I had the pleasure of skiing with your crew at Whitefish last March-ish. Great to have met you guys…some great skiing on that trip. I have since moved to Montana and am living and skiing in Big Sky this season. If you are ever in the area hit me up. Regan, Great to hear from you! We had a blast and it was a pleasure to ski with you also. Not sure if Montana is in the picture for me this winter but if it is I’ll be in touch.